The exterior of this hillside walkout home plan is rich with detail, from the stone arches to the sloped shed dormer over the garage. A beamed cathedral ceiling tops the living area from the island kitchen to the cozy fireplace with built-in cabinetry. The bedroom/study displays a coffered ceiling and has its own private bath, while the master bedroom enjoys a cozy fireplace and porch access in this home plan. The lower level is perfect for guests with two bedrooms, bathrooms, and a spacious rec room with fireplace and wet bar. Porch - Front: 158 Sq. Ft.
Porch - Rear: 341 Sq. Ft.
Porch - Rear Lower: 534 Sq. 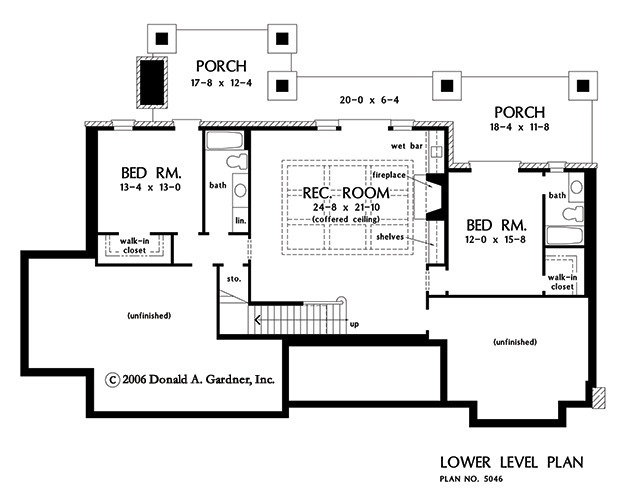 Ft.
House Dimensions: 72' 4" x 65' 0"
Bedroom #3 : 13' 4" x 13' 0" x 10' 0"
Bedroom #4 : 12' 0" x 15' 8" x 10' 0"
Bedroom / Study (Coffered): 15' 4" x 14' 0" x 10' 0"
Dining Room (Cathedral): 12' 8" x 16' 0" x 20' 7"
Foyer : 9' 0" x 10' 0" x 20' 4"
Garage : 24' 0" x 25' 4" x 0' 0"
Great Room (Cathedral): 20' 4" x 16' 0" x 20' 7"
Kitchen (Cathedral): 11' 8" x 16' 0" x 20' 7"
Master Bedroom (Cathedral): 18' 0" x 15' 0" x 16' 4"
Porch - Rear : 18' 4" x 11' 8" x 10' 3"
Porch - Front (Barrel): 19' 1" x 8' 4" x 12' 6"
Porch - Screen (Cathedral): 17' 8" x 12' 4" x 17' 9"
Rec Room (Coffered): 24' 8" x 21' 10" x 10' 0"
Utility Room : 8' 0" x 9' 2" x 10' 0"